Posted on May 30, 2011, in Acronicta, Acronictinae, Invertebrates, Lepidoptera, Noctuidae. Bookmark the permalink. 3 Comments. Sounds pretty challenging. I can’t imagine how you’d get single caterpillars into all the various shapes (could use more than one though). 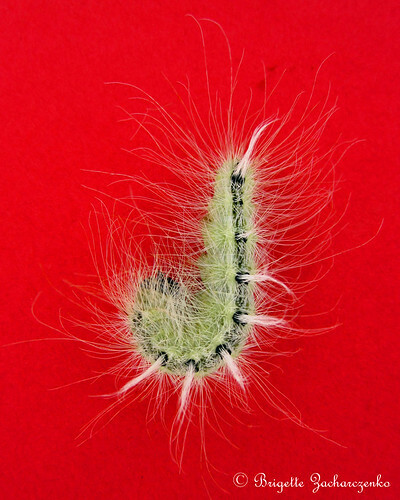 How about looking for patterns on the caterpillars in the shape of letters? Yeah I was thinking I’d have to use multiple caterpillars – and very gently! Good idea for looking for letters on their bodies, too. Some definitely have some cool squiggly patterns the more up close you get. Maybe if I take more photos through the scope I can find some good patterns. I’d be happy just seeing the letters you can find.